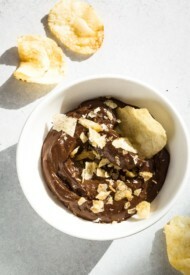 I was looking for recipes that at kosher for Passover and it came to my mind that this may be, and it is!! I found the instructions clear and concise, and I folded the mixture 53 times. It was a great idea to count them. The shells came out perfect!! They have good feet and are the right amount of chewy. The only part I had issues with was was the filling. I definitely did not do the recipe right. Consistency was great… I didnt have any unsalted butter so i used salted. DON’T USE SALTED BUTTER. Please. Just don’t. Not worth it. Out of laziness in respect to the filling (specifically the egg bit) I ended up going with another person’s filling recipe. It is just ok, very very sugary. Next time I’ll be better prepared for the filling bit!! Thank you for the recipe!! Leah, so happy your macarons turned out. And bummer on the filling. But you’ll get it perfect next time. 😉 Thank you so much for your feedback! Worked beautifully on the first try! 😍😍😍 Thanks so much for the recipe! Yay, so happy to hear your macaron success! Thank you for your feedback, Jen. Hey so I made this recipe twice now and both times I found that the batter was too runny and was very hard to control when piping. The first time it was very difficult to pipe but it turned out fine at the end. However the second time most of the batter just spilled out of my piping tube, and it was impossible to work with. I was wondering what I did wrong though because I am fairly sure I didn’t overmix it – I did 50 folds as you said. Hi, Aanya. Thank you for your feedback. It sounds like the batter is being over-mixed. The main culprit to runny batter is over-mixing. The number of folds isn’t the most important factor here. It’s important to keep an eye on the consistency. If you feel like the batter is reaching the right consistency even after 30 folds, you can safely stop at 30 folds. Hope this helps. Keep trying and you’ll find your groove. Couple of questions, if I may. You mention freezing the macarons. Do you freeze them filled and all finished? Can you explain how you freeze them and thaw them (in detail for us novices)? Also, do you have any tips for which almond flour to use? Hi, Judy! 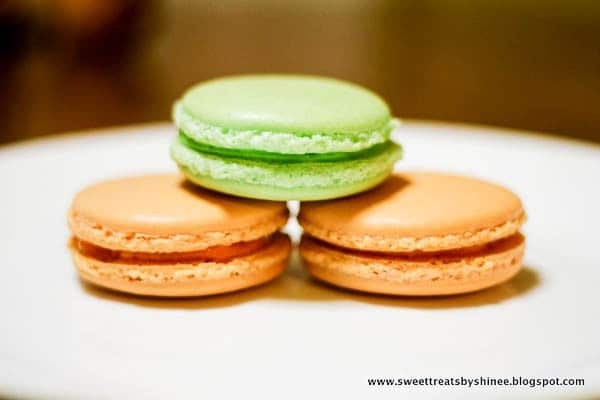 You can freeze both filled and unfilled macarons. It really depends on your filling, but most buttercream and ganache fillings are great for freezing. To thaw them, you want to transfer the frozen macs from freezer to fridge for a few hours, or overnight. Then bring it to room temperature about 30 minutes before serving. I’ll update the post with this information. Thank you for asking. As for almond flour, I’ve used many different ones. This’s what I’m using right now. Shinee, t’s really awesome! This will quickly become a favorite in our house! That’s awesome, Olga. Thank you for your feedback!! FInally turned out ! Thanks for the recipe! Yay, so happy for you, Tina! Thanks for sharing your feedback! macarons are my favorite treat but i have always been too intimadeted to make them. Today i finally tried and for my first attempt I am so pleased! Mine were a bit grainy and didnt have the gloss tobthe shell i think i may have undermixed from reading similar comments above. My experience did not yield as many cookies as it should have, but im wondering if my poor piping skills are to blame. Seriously thabk you for your detailed approcahable recipie. I plan on making them again and again until I perfect my technique. For my first attempt I think it came out lovely tasting and the texture wonderful. My piping skills however need work though. Great recipe!!! Have always made macarons using italian meringue but decided i wanted to give the french method a go. Made this recipe following the steps and the texture and taste is perfect and the shell is nice and full (something i havent been able to achieve with the italian method) but the shells are wrinkly. Different to lumpy, the skin is smooth as such but it has wrinkles that head towards the centre of the macaron. Couldn’t find anything on wrinkly shells in the troubleshooting guide. What do you suggest? This was my first attempt at French macarons because I finally got a new stove with a properly closing door 😋They came out PERFECT! Thank you for the awesome recipe and great tips. I especially like the pictures showing the steps. It’s important to see what your batter should look like and a lot of recipes just assume you should know this. Awesome. So happy to hear your macaron success, Kristin. Thank you for your feedback! I normally toast my almond flour as it helps with the flavor can I do this before I try your recipe, I will let it cool back to room temperature before I start. Also can I use caster sugar instead of “normal” cane sugar in the egg whites? I have found that using a egg white from a duck and chicken weighs out perfect. Of course most don’t have duck eggs about but here on our farm were loaded with them. Thanks for taking the time to answer my questions in advance. Hi Medody. So sorry foe my delayed response. You can use caster sugar in meringue. 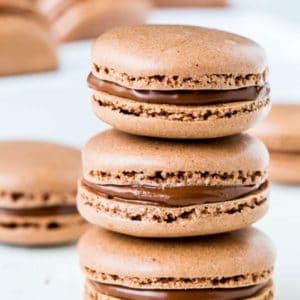 I love your (basic) macaron recipe. This is a whole new experience for me. I made it several times & always came out delicious. & beautiful feet too. I would love to try these Hazelnut-Almond ones too. I noticed the total nut flours gram is 120 vs the usual 100 gr of almond. But egg whites & sugar are the same. Just curious why this needs 120 gram ? does it bake firmer or fluffier ?? I have made a different recipe but my shells have been hollow both times. I’m going to try your recipe tomorrow. My question is what is the difference between soft peaks and firm peaks. I’ve gone through multiple recipes and they bounce between soft and firm so not sure the difference and when do I stop whipping the meringue? the soft peak curls over itself. The stiff peak stands straight up (Tip: when you turn the bowl upside down over your head, the stiff peak stay put in the bowl!) That’s the perfect stiff meringue. Stop mixing then. my experience ! Why did you instruct to sift the almond flour and icing sugar together, then to add them separately? Completely messed up the recipe and now a load of expensive ingredients have gone to waste. Where in the recipe does it say that the powdered sugar is sifted and then later, added separately? I see in step 2 to sift the almond flour and powdered sugar together and that is added to the whipped egg whites in step 4. In step 3 the 1/4 of regular suger is added to the egg whites. I keep rereading the recipe and just do not see where the almond flour and powdered sugar are added separately. Your correct Jill it says to sift the icing sugar and flour together twice and set aside. You add regular sugar to the egg whites, she goofed. You should ALWAYS read a recipe two or more times first. Is the 150 degree for a fan or conventional oven please? I’m baking them at 130-135 degree fan for 20-25 minutes and they’re coming out wrinkled and a little flat. Please can you help, I’ve tried this 4 times now. Hello, the 150 C is for Celsius temperature ovens. Use 300 F on regular bake. 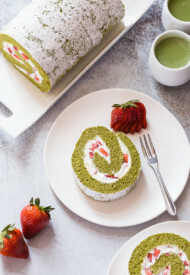 OMG I’ve been wanting to try and make these, I absolutely love the ones from my local bakery. I liked how your recipe is the “basic” one. On my first attempt they turned out great, I’m so excited!! Can’t wait to try more and with flavors and colors!! Hi Christina – sorry for the direct comment! Could you please let me know if you used a fan oven or conventional oven (or otherwise) at 150c/300f? That would be very helpful and much appreciated! Hi, I used conventional oven at 300. Partway through the cooking I opened the oven door for about 15 seconds to let any moisture escape (I learned that from a pastry TV show). Make sure before you bake them you’ve let them rest on counter to dry, this is very important. Can you add food coloring to the buttercream? These are awesome! I had a little trouble with the first round, but between your blog and the internet at large, I determined that I had just undermixed. Using the figure 8 trick proved to be immensely helpful, and this time they came out gorgeous – no cracks, lovely feet. Well Hellen you can just look up a conversion chart. Hi, Hellen. 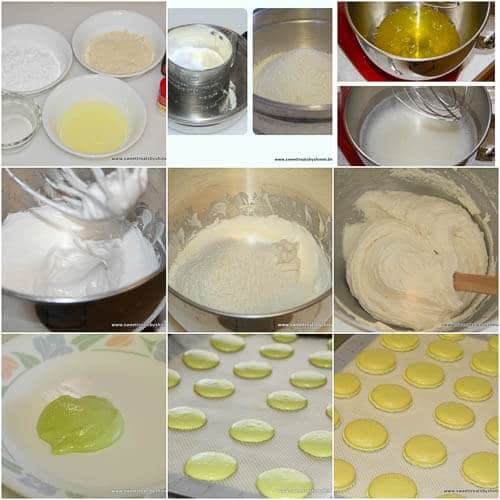 Macaron recipe is very precise, and I found that it’s easier to mess up when the ingredients are measured by volume. For the best chance of success, I highly recommend weighing all the ingredients. And that’s why I provided only the weight info. I actually looked for a recipe in grams. I find it easier for recipes where proportions have to be just right. This is the first recipe I tried and it came out perfect the first time! I’ve tried several recipes since and have had disasters, I’m sticking to this one! i tried this recipe and my batter was stiff and grainy. i don’t know what i did wrong. Great recipe. These turned out very well. Awesome. Thanks for sharing your feedback, Helen. I wanted to bake something sweet that all my teachers would love for the holidays. My mom has tried to make macaroons before and it went terribly, so I was hesitant trying to make them myself. Thankfully, your recipe was easy to follow and the cookies turned out perfect! Thank you so much, these were amazing! Definitely going to make them again! Awesome, Emma. Thank you for sharing your experience. Can I use regular flour instead? Hi, Julie. No, for french macarons, you need nut flour. Omg omg omg they’re perfect!!!!!!! Seriously perfect! I look like a hero right now with my kids hahha thank you!!!!! AWESOME!! So happy yours turned out, Sara. Thank you for your feedback. you subbed the full 1/2 c butter with cream? or only half the butter ? The recipe was very easy to follow. But I have a question about the almond flour. The macarons have a slight grainy texture. The almond flour bag says almond meal/flour – finely ground. Is that the right flour or should I look for something else? Hi, Diane. Mine usually says “Almond Flour”. I also prefer finely ground, with blanched almonds. Another thing is that when the batter is slightly under-mixed, you’ll get kind of grainy shells as well. I made a double batch and they came out just fine. I do agree with orhers that this recipe when compared to other recipes trends more toward a moist shell and I can see why it might fail in humid areas. For me, the most special part of this recipe is your amazing buttercream. Now, I did sub half brandy for the milk, but the texture of the buttercream was silky and creamy without being overly sweet. Fantastic! I bake a lot and I think this buttercream will quickly become my favorite go-to recipe for fillings on cakes, cookies, and eclairs. Bravo! Thank you so much for your feedback, NurseBaker! Glad my recipe worked for you. Thank you for a wonderful recipe! I have made my second batch now and both times they have come out perfectly. I followed the directions exactly as well as reading other comments and other recipes that are available. The only thing I missed was how much vanilla you should add to the egg white mixture. I added a splash on the first batch, and on the second, I added 1/4 teaspoon of almond extract for a change. Thank you!! Hi, Ellen. Thank you for your feedback. I forgot to update the recipe direction when I removed the vanilla extract from the ingredient list. Since some people have issue with too much moisture, I removed it. 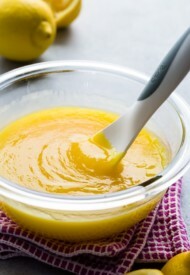 But up to 1/2 teaspoon of extract is usually fine. This recipe turned out absolutely terrible for me. They didn’t have feet and they were uneven and brown. I followed the recipe exactly! I would not recommend this recipe. Hi, Sarah. Thanks for trying my recipe and for your feedback. Sounds like your oven runs hotter. 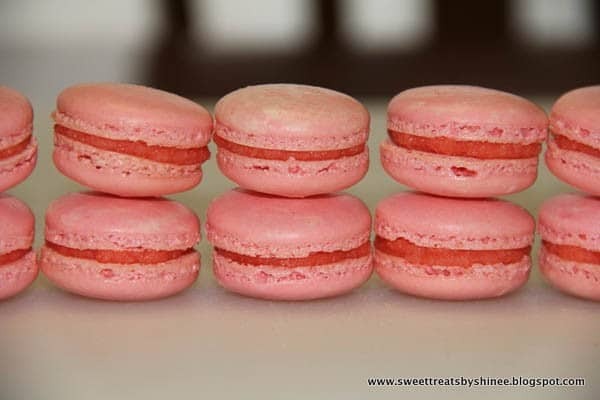 Your macarons shouldn’t have browned at 300F, unless you baked them way longer than specified. I recommend getting an oven thermometer and double check the accuracy. Most ovens fluctuate 10-15 degrees either way. Hi, Epcibha. It depends on the size of macarons. I usually get about 25-30 filled macarons, around 1.5-inch round. Thank you Thank you Thank you!! I have failed so many times and today, I have feet! AWESOME. So happy you finally had your macaron success. Thank you for your feedback! I using a gel food coloring but they are not bright. What brand gel colours you use for macarons? Hi, Wanda. On these pictures, I’ve used Ateco gel food coloring. But I also frequently use Wilton as well with great results. So I’ve made this recipes 3 times and it just doesn’t work out. I don’t know what I’m doing wrong. Anytime I leave the macarons out to dry they don’t dry. I’ve tried leaving them out for over an hour and they were still wet. And when I put them in the oven the barely have any feet and just rise up a little. At first I thought it was cause my meringue was to soft but nope. Any tips? Hi, Farwah. Sorry to hear you didn’t have a good luck with my macaron recipe. Typically, the macarons don’t dry quickly when it’s humid. If you live in a humid climate, I suggest running a fan nearby, but not directly at the macarons. I’ve heard some people dry their macarons for 2 hours. Also, do you have an oven thermometer to check the accuracy of the oven. Every oven heats differently, and if your oven is off by even 10-15 degrees, it could affect the rise of macarons. Let me know if any of these help, and if you have any more questions. Thanks! Hi, Tagan. How would you describe a perfect macaron? Thank you, Katie. I agree with you. I like macarons with soft and chewy interior (slightly cakey) and crisp thin skin on the outside. Thank you for this recipe! This was my 3rd attempt to make macarons and by far the best batch. The other two batches (following a different recipe) did not work at all. And while I have plenty I can still work on these turned out great for a beginner. Thank you again!!! Katie, glad to hear your feedback. Thanks for sharing! Awesome. Thank you, Hayley, for your feedback. My Macarons did not form a firm top even after letting them stay out for about 30mins to an hour, why could that be? Hi, L. If it’s humid in your area, it takes a while to form a skin. You can also try running a fan if it’s humid. Hi, I want to make this recipe but I can’t use cream of tartar due to dietary restrictions. Is there a substitute or can I leave it out altogether? Hi, Allya. You can omit cream of tartar. It just helps stabilize egg whites, but not mandatory. Good luck! My macaroons did not come out with feet. Hi, Bella. There’re couple of things may cause no feet. The batter may have been over-mixed, or oven temp was too low. Take a look at my troubleshooting guide to learn about troubleshooting. And feel free to reach out to me with any questions. Thank you! Hi, Loren. You can use hazelnut flour instead, or pistachio flour. My first attempt at making macarons and they came out PERFECT thanks to this recipe. YAY! So happy for you, Kathleen. Thank you for your feedback! I’ve never made macarons before a few days ago when I used this recipe. Worked really well and I was very impressed. So happy to hear that, Nina! Thank you for your feedback! Yay, so happy you enjoyed the recipe. Thank you for your feedback! There seems to be more almond flour than other recipes I’ve tried. I ended up with a thicker end product that did not resemble a macaron when baked. Most recipes call for 3/4 c instead of 1 c. No matter how much I folded it was still far too stiff when piped. Disappointed with the results. Same thing happened to me, I was standing in my kitchen for 10 minutes folding my batter and it was still staying too thick. I definitely think that’s it’s because of the almond flour to icing sugar ratio. Other recipes I’ve tried making the batter has always turned out too thin, but not this time. Hi, Sandra. Thank you for your feedback as well. 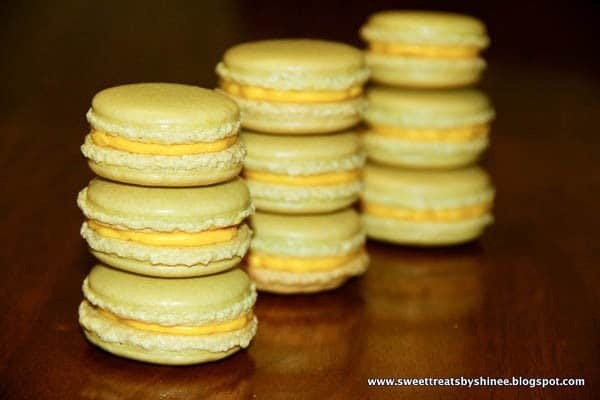 I’ve used this basic macaron recipe for many years now and adapted it for different flavors, and it works great despite the ratio is different from many macaron recipes. My suggestion is to weigh the egg whites to make sure you’re getting enough egg whites, because it’s an important part to the ratio as well. Let me know if you have any more questions. Hey Melissa. Sorry I missed your comment. And I’m sorry to hear the batter was too thick for you. How did you measure the ingredients? By weight or by cups? Also did you weigh the egg whites by chance? You’re right in that my base recipe calls for more almond flour than most recipes. But that’s exactly why my recipe is different from others because it yields less sweet, more almond-y macarons that I really love. I highly encourage anyone who’s making macarons weigh the dry ingredients as well as egg whites. I tried it recipe it’s good vand amazing.can I keep in freezer???? Hi, Nishanth. Yes, you can freeze the macarons. 🙂 Thank you for your feedback! This was a great step-by-step recipe! I was a little nervous for my first attempt at macarons but you broke the steps down in perfect form and made it easy. Hi, Di! I’m so happy you find my recipe helpful. Thank you so much for your feedback. Does this yield 25 to 30 halves or cookies? Hi, Sean. About 25 filled cookies, so about 50-60 rounds. WOW. We were only able to get 12 cookies out of this recipe :(. I think perhaps folding it even more? Hey, Sean. How big were your cookies? Mine are 1.5-inch rounds, so they’re pretty small. Yes, you can! Filled macarons especially with buttercream filling, freezes beautifully. Just make sure to wrap them tightly, but carefully. Hope you’ll enjoy baking these, Evelyn! Hi! I made this for my daughters birthday and after trying so many recipes this worked perfectly. Thank you so much for the Recipe and clear instructions. My Guests raved about it and the best compliment I think i got was they were delicious and not overly sweet which I found the problem with other recipes. Thanks much again. I finally found my best Macaron recipe. So, so happy to hear your macaron success, Juveria! And I’m so glad you agreed that my macaron recipe is less sweet than others, which was my experience as well. Thank you for trying my recipe and for your feedback! I will try your recipe for the first time and I bought all the ingredients but I think I buy the wrong almond flour. I buy the I bleach almond flour. Is this ok to use? Pls let me know and thank you in advance. Hi, Leila. Do you mean blanched almond flour? If so, it’ll work just fine. It simply means the skin is removed. I also use blanched almond flour. Let us know how your macarons turn out. Thanks! Just wondering how much food colouring you recommend using? Hi, Lyd. I usually just eyeball it. I start with couple of drops of gel food coloring and then add more until the desired shade. Thankyou – also what brand of food colouring do you use? I use Wilton gel food coloring. Can you use rice flour instead of almond flour? Hi, Margie. I don’t think you can. Hi, I’ve baked Macorons two times and they have come out different each time. The first time they had the ruffle, but they didn’t smooth out at the top when after I piped them out onto the the trays and they baked into those shapes. Even after I let them sit. Then, the second time to solve that I folded the batter more, but they’ve come out cracked on the top. Both times the batter has been extremely grainy looking like the ingredients haven’t dissolved. I was thinking that I might not have enough egg whites. Could that be it? Hi, Breahna. Sorry for delayed response. How did you measure your egg whites? Did you weigh them? If not, you may have been short on egg whites, and the batter didn’t thin out well. Also, do you think your almond flour is on chunk side? I always use fine almond flour and I don’t have much problem with bumpy texture. I watched your video and noticed you mentioning that there will be some leftover almonds after sifting. Do you have a measurement of how much dry ingredients you actually end up adding to the 70g egg whites (minus the almonds you sift out)? I’m always getting hollow shells, so I’m wondering if it might have to do with the dry ingredients to egg whites ratio. Thanks! Hi, Karen. At most you should get about 2 tablespoons of dry ingredients to toss. I don’t measure the weight of the dry ingredients after the sifting. Hollow shells are usually caused by over-beaten egg whites. Maybe try keeping a close eye when whipping the egg whites and stop as soon as meringue reaches stiff peaks. The recipe says it yields 25-30. Is this shells or actual macaron cookies? I only got 20-22 shells. I undermixed the batter (since I have bumpy tops) but I’m not sure what else I could have done wrong! My macarons have feet but are a little dense and chewy. Hi, Melissa. I usually get 25 filled macarons with my basic macaron recipe, which means I get somewhere around 50 shells. 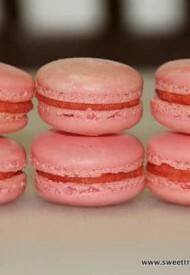 But my macarons are about 1.5-inch rounds, pretty small. When piped they’re about 1-inch or so, and they spread a little and come out around 1.5-inch rounds. How big macarons did you pipe? Also did you weigh your egg whites, or did you just used 2 large egg whites? The reason I ask is that maybe you had slightly less egg whites, which made the batter thicker than it should be? My rounds were about 1.5-2″. I didn’t weigh the egg whites. I only have a non-digital kitchen scale at the moment which is why I didn’t. I guess a digital kitchen scale is on my list for future baking endeavours! Made these with my 16 yo son. Your tips were incredibly helpful and other than a little odd shaped (we need to work on our piping) they came out great and they are delicious. We will double the recipe next time! Yay, so happy you enjoyed baking macarons with your son, Amy! Thank you for your feedback! Hello these look delicious. Im afraid ill make a mistake while making the macarons. If it’s possible could you post a video? Hi, Tasha. Sorry for delayed response. Here’s a video of my funfetti macarons. Hope it’s helpful. 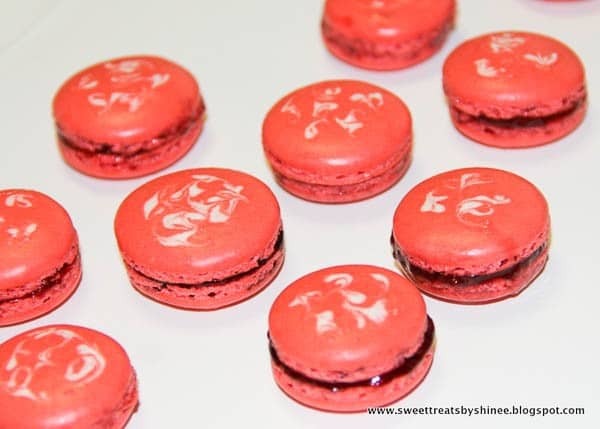 And you can also read this Macaron 101 post before you start. Good luck! Hi, Lacy. If you’re wondering about the sugar that goes into the egg whites, then yes, you can use ultra-fine sugar. I was wondering if you remembered what made your macarons perfect on the outside but completely hollow? That’s what happened to mine yesterday. I think the oven temp may be inaccurate so I’m buying a thermometer, but other than that? I have a tendency to beat my meringue about a minute after it gets glossy and stiff just to make sure I’m not under beating it. It’s still glossy and stiff but I suspect that I whipped too much air into it? I also am really careful with folding in order to not over fold, but I know that I get it to ribbon stage because it passes the infinity test and moves slowly and consistently in ribbons off my spoon but maybe I should deflate a bit more aggressively and check for ribbon stage earlier? Yesterday I cracked one shell in the oven and it wasn’t hollow but when I removed the macarons to cool a few minutes later, they were all completely hollow. I’m just pretty confused but also really motivated to get it right. I’m going to try out your recipe next because I also suspect that the ratio I used called for too much egg whites (3eggs for 1 cup of almond flour and 1 and 2/3 cup of icing sugar), so maybe with your recipe there won’t be an excess of air in the macarons? Hi Nina! Thanks for reaching out. Hollow macarons are usually due to over-mixed meringue, which sounds like exactly what you’re doing. I don’t advise beat the meringue after it reaches stiff peaks. 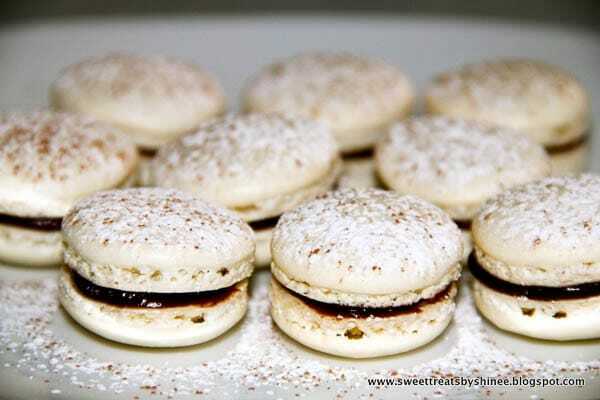 Hope this resolves your issue, and please do let me know if you try any of my macaron recipes. Hi, Patrick! Yeah, I think they need a bit more time in the oven because silicone doesn’t transfer the heat as well. And if yours are still stuck to the mat, that means they’re under-baked. Thank you, and Merry Christmas to you and your family! We have a natural gas oven and I used to bake them to 25 minutes when I used parchment. What do you think, 30 minutes now that I am using the Wilton silpat? I’d increase by 2 minutes and check. Hello, after several attempts I have just about got it! Just wondering if there is a better measurement for egg whites. Sometimes I feel like a need a little bit more than just 2. But 3 might be too much. Is there an ideal amount? Thank you for this wonderful recipe! I made fruity cereal french macarons this weekend … Any tips on transferring the batter into a piping bag… silly question it may be, but I struggled with my batter and ended up making it thin after the 10+ min. it took me to transfer it. 🙁 It made my macarons spread together on the parchment and not bake upright – they were more like flat cookies, such a disappointment. They were also extremeeely chewy and made my jaws hurt from chewing them … I let them sit for 15/25 minutes to get “skin” and then baked them at 325º for 15/20 minutes. Hi, Bryn! Thanks for your kind compliments. I’m glad I inspired you to make some macarons. I made this video tutorial and I hope it answers your questions. Let me know if you have any questions. Yes exactly. Thought I used parchment paper not silpat. Hhmmm, those bulging feet happens to me only when I use silpat, and never on parchment paper. So I’m kind of baffled. Sounds good. Let me know if it helps. To prevent browning of macarons you mentioned to place an empty baking sheet on a top rack. What do you mean by that? I place the baking sheet with macarons on a bottom rack in an oven, and at the same time an empty baking sheet on a top rack of the oven? Hi, Hiba! My oven has two racks. I usually place one in the middle of the oven and the other one on a very top. I put the baking sheet with macarons on the middle rack, and if they start browning, I just an empty baking sheet on the very top rack. Hope it make sense. Ohhh now I get it! Thanks for the tip. Sometimes when I bake plain macarons (without any dye) they dont remain white after, but turn slightly yellowish. Does the top tray tip help with keeping the macarons white? It’s been a while since I baked just plain white macarons, but I don’t think they ever been true white because I usually add some vanilla extract. They are a little on off-white side. But if your macarons are becoming brown due to overheating, I think the top tray tip should definitely help. Not exactly sure what do you mean by bubbles come out of the feet? You do want those feet to form, and they kinda look like bobbles. Do you mean they expand and bulge like I’ve shown in my pictures above? Sain, sain bn uu? Almond flour Mgl-d haanaas olohiig helj medehgui ni. (Bi Mgl-d bdaggui yumaa.) Vanilla extract gej vanilinii ohi. Vanilla zucker/sahar hiij bolno, bur hiihgui ch bj bolno. 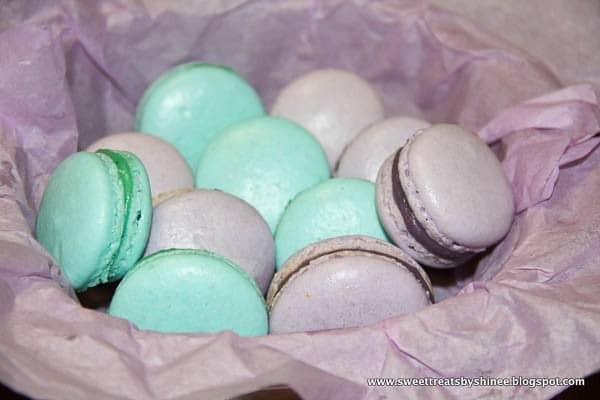 Hi bi ih olon udaa french macaron hiih gej uzej bna. Eroosoo neg tiim hovsgor tegeed gadna heseg ni mash jijighen jijighen nuhtei ch yum shig , holgui, bas dundaa hondii bolood bnaa. Bi 55 orchim hutgasan. Chinii bichseneer heterhii baga hutgaad bna u? Zuurmagni otgon shingen ni her baih estoi yum? Zolboo, ta minii zaavariig neg burchlen dagasan uu? Esvel uur joroor hiisen uu? Jijig jijig nuhnii uchir bol listen deeree shahaj tavichaad listee 3-4 udaa shireendeere sain tsohij hiig ni gargaj uguhgui bolohoor tegdeg. Hulgui bolohiin uchir ni jigneheesee umnu sain hataagaagui bol tegne. Hundii boloh ni olon yanziin shaltgaantai bdag. Bi 50 udaa hutgachaad zuurmagnaasaa jijig tavgand dusaaj uzej bgaad urgeljluulen hutgadag. Dusaasan zuurmag chini 10-15 sekundiin dotor jigderch bval bolson gesen ug. Amjilt! Za bayarlalaa, oldson buh joroor l hiij bna barag 10 garui udaa. Surahgui bol sanaa amrahgui bna. Chinii zaavraar hiisen, listee hed hed gazar tsohison. Hataah geed barag 3-4 tsag orhison tegeed hataagui gart jaahan naaldaj bhaar ni huleej yadaad hiisen. Video oruulahgui yum uu? macaron daa ymar filling uud hiideg ve? bi macarondaa buttercream guzeelzgenii variantai holiod hiisen estoi nyaluun boldogiin bna lee. jornoosoo huvaaltsaach? Strawberry Jam bas hiij uzsen, nadad ih nyaluun sanagdsan shd. Hi Shinee, ene ungunuudee yaj gargaj avsan be? Hi Ariunchimeg, bi zugeer Wiltonii hunsnii budag hiigeed l ungu oruulchdag shd. Gel-g ni. I see, bayarlaa. Bas neg yum. Convertoroor 3/4 cup 177ml bolood ard ni bichsen 2,5 oz ni 70 ml bolood bhin. Ali ni zuv be? Sain medku bolhoor iim yum hurtel asuuhnee. Aan, huurai, shingen, za tegeed hemjij bgaa yumnaasaa shaltgaalaad yumnuud uur uur hemjigdene. Almond powderiin huvid 3/4 cup bol oiroltsoogoor 95gr boldog yum. Cream of tartar gej yu bile? Cream of tartar gej undugnii tsagaaniig togtvorjuulah uuregtei nuntag tsagaan yum bdag yum. Bhgui bol hiihgui bj bolno.